. . . . as far from 5 miles up in a jet propelled steel machine as one can get, I muse from sea level aboard our floating steel home in the harbor of a simple town in Alaska's Kenai Peninsula. While my soulmate beats his head against the proverbial wall working insane hours with mountains of stress every day just so he can provide shelter, comfort and soft couches to his family, each day I nurture, teach, marvel at and lose patience with our children. In the big city of Anchorage I become lost, unclear of my purpose or of how I might touch the world and make a difference, frustrated and devoid of direction - I feel actually insane at times, out of control of my Self. Here at our cabin and sailboat I don't feel that. I am able to breathe deeply more often. I survive - splitting wood for fire and warmth, gathering greens for cooking, baking bread, reading, fixing water systems, repairing boats, knitting hats and mending sweaters, planning excursions into town for groceries, showers, laundry and socializing . . . . my husband has given me this, graciously agreed to support the family while I nursed our babies and now learn and grow with them . . . . I fear he is losing his Self in it all, I worry he is moving toward the businessman's heart attack or breakdown or worse loss of spirit . . . . so I am grateful that we have a common goal, a dream coming true, our plan to leave it all and sail the seas, our way of escaping the fast-paced whirlwind of this society and instead touching the earth and sea and becoming part of it all again in a more basic, slower way . . . . we will touch different cultures, work and help others along the way, teach our children how they fit into the larger natural and civilized world . . . . meanwhile, my list has grown to a height that seems insurmountable, but I am inspired, I am motivated and alive, and I thank my husband for this peace and rejuvenation because he has given us Seldovia . . . . I promise, my love, you will be able to play and create and explore and, I hope, never step foot in the rat race of corporate life again if that is what you desire . . . . you may follow your heart from now on, my love . . . . I sit here in Seldovia, Alaska (a village of 200+ people 6 hours via boat & car from the nearest Costco or mall) aboard our sailboat that will next year be our permanent home, and I think about my husband who is 5,000 miles away on a business trip. He spends so much of his day negotiating, meeting, worrying, rushing from place to place in his very prestigious corporate job that keeps us, his small family, afloat and literally unplugged in this remote paradise of the world. His fast-paced stress-filled efforts and sacrifices give us this slowed-down magical life each summer. Things are slower here. At the cabin, we eat when hungry, sleep when tired, paying attention to the time only to assess the tides. A few times a week, we come into town from our cabin via a 1 1/2-mile hike or a little red zodiak doning an ancient 7hp Johnson outboard. In town, we grocery shop, do laundry, take showers, go to swim lessons and pottery, visit with friends. When we return back up the bay to our cabin, we eat wild nettles, fiddleheads and greens for veggies and stay warm with a wood stove. The 20+ -foot tides determine our level of activity, as when the tide is out and our boat is dry, we do not go anywhere. We build forts, chop wood, tend the garden, play games, and read. We slow down. I get my laundry done by calling the local laundry guy, who meets me at the 2-machine laundromat, lets me in and meets me back a half-hour later to switch to the dryer. We chat about town goings on and how he lost a finger over the winter to a sawing accident. 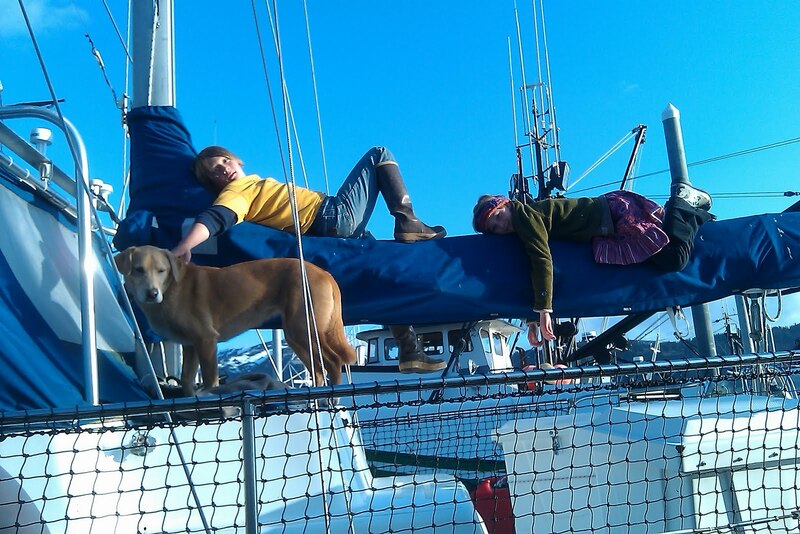 To Sell or Not to Sell......Thoughts About "Home"
One of the biggest decisions we have to make before we depart for the open sea is whether to sell or to rent our home. We have talked into the wee hours of the night about the pros and cons, about what this house means to us, about how the finances will be different if we rent versus sell. Until now, I have been holding on to the idea of coming back to our home. There is a peaceful energy here, a sense that it was built with love. We are only the second owners, and the first were homesteaders who built the house themselves in the 1950's (this makes it a VERY old house in Anchorage, Alaska). 3001 Brookside Drive is the place where we raised our babies, where they first nursed, crawled, laughed and slept. It is our first home. There is a cliche that keeps popping into my head as I ruminate about this - "Home is where the heart is." More and more, I think I believe it. When I go deeper (as my yoga instructor would say), I realize that my attachment to this place is more connected to the environment, to the view, the energy, the natural setting, to the memories that are connected to the physical house, not really the house itself. I woke up one day last week feeling somehow released of the sadness connected to leaving this house forever. Feeling lighter and happy about selling the house and being more totally free while living a life of salt air and adventure. So watch out, Anchorage friends. If/when we return from our travels, we will most likely be penniless AND homeless and looking for couches on which to crash. One big decision made. Hundreds more to go. Now time to PURGE, pack, clean, paint, and do all that is necessary to extract 10 years' worth of living from a home. As soon as my daughter learned to stand on two feet, she spent much of her time hanging onto my leg as I moved through the house. I became accustomed to walking gently in order to avoid crushing little toes. A shuffling gait started to feel natural. I mastered the skill of prying open little fingers in a playful way, gently releasing her grip without hurting feelings. I became an excellent untangler. The other day my kids (now 10 and 8 years old) were playing Twister. "Right Foot Red" "Left Hand Yellow" "Right Foot Yellow" "Left Hand Blue" Laughing, bickering, crashing, starting over. Watching them get all tangled up, then untangled, then tangled again, I realized that my recent efforts to untangle myself from the everyday clutter of my life are sort of like a game of Twister. I become accustomed to one position, then the wheel spins ("Right Foot Blue") and I shift. Once there, sometimes I become untangled and breathe a sigh of relief. Other times, I move with the universe's next spin ("Left Hand Red") and off I go, toppling, off-kilter, so tangled I fall over. Get up, brush off, and start again. In about 500 days, I will depart Seldovia, Alaska on a sailboat for the adventure of a lifetime, a passage around the world with my family. Between now and then, I will be untangling from the day to day life we have built. Untangling from my clothes and my stuff, from bank accounts and credit cards, from friends and my house and my gear. Participating in a gigantic Game of Twister. Bring it on! Spin the wheel! As far as untangling my daughter from my legs, things have shifted a bit. At eight years old, my little monkey girl still hangs on to me - long wiry legs wrap solidly around my middle, head snuggles into my neck, arms wrap around my shoulders with a lion's strength. Now I hold on. I don't want to untangle her anymore, I hold her tight, the lioness mama wrapped around her cub. "Where are you going?" This is the first thing people ask me when I tell them of our plan to turn our backs on work, school, our home, friends and family - to truly walk away from the American Dream in which we have somehow found ourselves enmeshed - and sail. My answer: "South." And the only reason I have an answer at all is because departing from Alaska leaves little room to travel North (yes, admittedly, warm weather is also part of the allure). The next question is this, "For how long will you be gone?" My answer: "We don't know, we don't have a plan. As long as we want to or until the money runs out." Go. For as along as we can. Explore. The world's natural beauty and cultures. To Learn and Grow every day. We are going for the journey. We will travel when it is safe to do so. We will stay in one particular location as long as the spirit moves us. We might return to Alaska some day or we might wiggle our toes into a sandy beach and plant roots somewhere else. We might never live on land again. 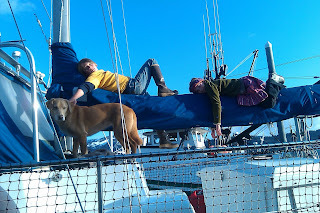 We bought and delivered our cruising sailboat, "Northern Passage"
Two big steps, for sure. But will either of these things actually get us onto the water? Absolutely not. Many of the sail cruising books, in fact, warn against purchasing the boat too early for fear that then you end up stuck with a big boat and no plan to get out on it. We couldn't help it, the boat came to us and we needed it. Right then and there. It just felt right. Meanwhile, there are HUNDREDS of things to do between now and July 2012, our planned departure date. Only now am I realizing that to actually get on the water and begin our un-planned existence will REQUIRE A HUGE AMOUNT OF PLANNING! I have been thinking about it for weeks, maybe even months. Finally, last week, I removed all of the artwork from two walls in my living room to devote this space to planning for the trip. These walls have become the place where we will Plan to be Un-Planned. What led me to this is my realization that I am a visual person. I NEVER purchase stuff online because I need to touch, see, feel it. Now I have a touch-feely, colorful, BIG visual of our plan, right in our living room.